As triathletes we all like seeing movies that have swimming, biking, and running represented on the big screen, from Chariots of Fire to Breaking Away to Jaws (I mean, she should have swum faster!) But how many people on the team think that the movie that best represents their life story is Billy Elliot? Prior to reading on, I suggest that you Google this movie to provide some context for this story if you have not seen it. The answer might surprise some of you, as that person is none other than Joe Kurtz. Joe is a modern day renaissance man, and many people on the current Boston Triathlon Team know only a little about this amazing person, triathlete, scientist, husband, father, and dancer. Yes, I said dancer. How did this all begin? His father simply called his bluff, and the story makes for a great Hollywood tale. Little Joe was 6 years old when he started to play soccer. But he was so uncoordinated that his parents worried that he wouldn’t be much of an athlete. His sister was already taking dance lessons, and not wanting to feel left out, Joe asked for them too. His dad said no, Joe persisted. 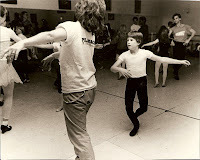 Finally, his dad said fine, thinking that Joe would never stay in dance lessons. Five years later, his sister was playing on an internationally-ranked soccer team and Joe had become a professional ballet dancer, at age 11. So at the ripe old age of eleven, Joe was playing soccer, swimming, and playing the lead role of Clara’s punk brother Fritz in the Chicago City Ballet’s production of the Nutcracker, working his way up from other smaller roles. Remember, back in the eighties, it was not cool for a guy to be a dancer like it is today, so Joe kept that part of his life on the down-low. Until, that is, the Chicago Tribune put a photo of Joe in his tights on the front page. As you can imagine, this was not good for Joe. It was like today’s version of Facebook, but worse, because every family got the paper and you could not delete the photo or unfriend them. After that, he became known as “the ballet dancer,” not the soccer player or the swimmer. While we may joke around today about Joe’s ability to push the limits with his wardrobe, it was no laughing matter back then when he was trying to get a girl. Any girl – it was junior high and who can be picky? Caution: this article gets a little after-school-special here. Anyway, while the kids in his school were busy being mean and excluding Joe, he was auditioning for the American Ballet Theatre in front of none other than Mikhail Baryshnikov. Score one for Joe, zero for the bullies. At age 16 Joe had to decide whether to pursue a full-time professional dance career or go to college. He chose college. 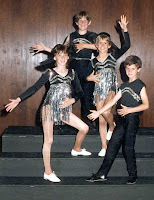 I should let you know that while the other kids were busy making fun of Joe for being a professional dancer, he was studying. As one of the smartest kids in the class, he got accepted to MIT. Score two for Joe, zero for the bullies. If you were worried that this story would not have a happy ending, you were wrong. College was, in a word, awesome for Joe. He was captain of the swim team (200 fly, 200 free, and anchor for relays), was invited to perform with the dance troupes at both MIT and Wellesley, and met his gorgeous wife, Kristel, on the shuttle bus between MIT and Wellesley, where she was a student. Ask him about that story sometime – we don’t have room here, but it is right out of a Lifetime movie. The best thing about being at MIT was that Joe could finally be himself. The ladies loved the fact that he danced, and he loved the academic life at MIT. But then he got fat. (Cue Disney music with image of Joe) Chubby Joe started running the summer between junior and senior year to lose weight. After college, he joined the master’s team at Boston University and met many friends and triathletes who encouraged him to join the CRP (Charles River Park) racing team in 1997. A special shout-out goes to some of the old-schoolers: Ingardia, Perutz, Bullinger, Upson, and others who really welcomed Joe. As some of you may know, CRP became Wheelworks Triathlon Team which became the Boston Triathlon Team. Joe is the second longest-standing member (Janice B. is the first!) and has competed in dozens of races. His favorites are Ironman Lake Placid, Escape from Alcatraz, and the Even Up race. His best finish was at Alcatraz (32nd out of 1999 overall in 2008) and he will return to Vermont this summer to go for the win at the Even Up race, which is his favorite distance for obvious reasons [Editor’s Note: 3.5 mile swim]. But unofficially, his best result was nipping Pokress at the top of the Kanc at Training Weekend 2011 to claim the $100 Dunkin Donuts Gift Card. Even though there may be no more money on it, he still carries it in his wallet. He is a mainstay at Walden Pond during open water swims, and even sports the famous “Golden Speedo” on occasion. Warning: the photo may not be suitable (pardon the pun) for small children. It’s not even suitable for many of us adults for heaven’s sake, but nobody ever complains. When I asked Joe to reflect on his past experiences and how they have formed him, his answer was not surprising. He has a soft spot for those people who are marginalized by society, who the mainstream has cast aside. He has no inhibitions about what he can do or what he wears because none of this defines his character (those of us who recall the days of Man-Ray know this all too well). No one aspect of Joe’s life defines him, and he balances all of them well. I have known Joe for 16 years and have always thought the world of him, but interviewing him for this member spotlight gave me a new perspective on his awesomeness. Thanks Joe!